31 years ago, John Hughes released a movie that, in 2018, seems quaint, dated, and newly necessary all at once. Think of how many movies you know — particularly family movies from the 1980s-2000s — that essentially retell the story of Ebenezer Scrooge. Perhaps holiday movies, like “Hook” or “Elf” come to mind? Back then, an increasingly fast-paced world, pushed forward by surges in technological advancement and booming industry, made it easy for filmmakers to refashion that story for urban/suburban family audiences. Corporate jobs kept dads working long late hours in offices, beholden to domineering, ruthless bosses, which of course turned once “fun dads” into stodgy, cynical, workaholic jerks with no empathy, patience or perspective. (Cue sad Golden Retriever dog whining at mean dad yelling at child who just wants his daddy’s company.) The message to said grumpy dads? Family comes above everything, even if your ego is dying for a promotion. 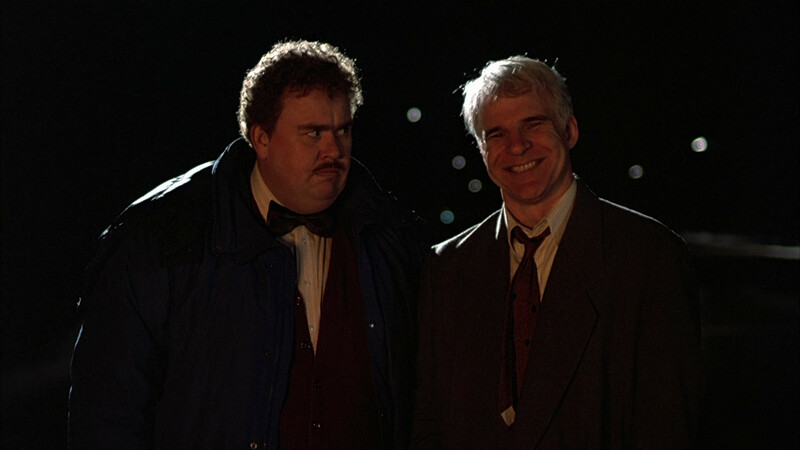 In the ultimate Thanksgiving movie, “Planes, Trains, and Automobiles,” while Neal Page (Steve Martin) may be stodgy and self-interested, he at least wants to get home to his family, and actually seems pretty devastated by missing his daughter’s Thanksgiving pageant. So, while the film subtly critiques how high-powered corporate culture can make people into self-centered clods, it still gives one (both) of the leads some redeeming qualities. The film is more a commentary on how the speed of modern life forces us to constantly reckon with what really matters. The grind of travel, in particular, can turn us into our worst, most petulant selves, as we try to regulate our reactions to the people around us while exhausted and sore. That’s why most of us can relate to Neal — his breaking points are totally understandable, even when he’s ruthlessly cussing out a rental car agent. 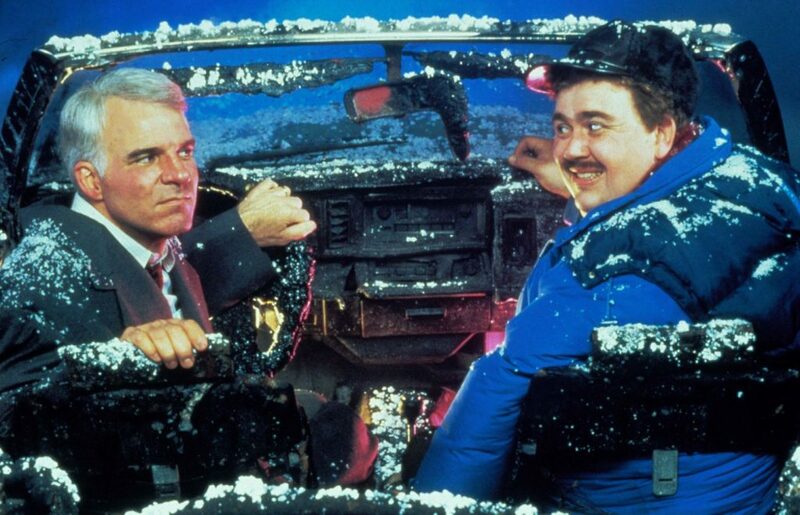 Here’s a list of 8 things that a movie from 1987 teaches us about how traveling during the holidays is a testament to the purity of our souls — and why it’s important to be kind to those around us who are along for the ride, no matter how harrowing. Apparently, this rule applies even if they are totally disgusting. 1. Our unwillingness to talk to strangers is far worse than it was in 1987. When is the last time you got into the back of a Lyft Shared or an Uber Pool and were greeted warmly by the person sitting in the backseat next to you? Probably that person was bent over their phone, and maybe they looked up to acknowledge your presence as you entered the vehicle. But I’m willing to bet at least the cost of a 1987 JFK -> ORD plane ticket that they didn’t excitedly strike up a conversation with you, ask you where you’re headed, or warmly bid you goodbye as you hopped out. We are more insular, more self-obsessed, more grossed out by just the idea of small talk with people we don’t know and who share the same cramped space as us. On some days, I’m saddened by this worsening trend, and on others, I’m that person bent over their phone who can’t be bothered to look up at the body next to me. Another case in point: we now have touch-screen order stations at McDonald’s. McDonald’s. You don’t have to say two words to anyone in a place where you barely say three to them anyway, and you can get hot food placed onto a table directly in front of you. What is life. 2. Cell phones would have made much of this movie go differently, but not all. Lines for pay phones? How cute. Trudging through snowy parking lots, highways and runways to tell a rental car agent that the rental car you were assigned wasn’t in the lot? Adorable — you could have just called their customer service and had them reassign you one, probs (or at least they would’ve told you not to throw away the rental car agreement!) Delayed flights and crowded hotels? Yep, that still happens. For all the inconveniences that 2018 life has eliminated, there are some things that will just never change — those events caused by forces of Mother Nature that bring us to our knees. (Although I can’t really see any major train line getting away with making people carry their luggage through the snow for a mile and a half, at least without getting hella bad Yelp reviews). 3. Vibrating beds are a terrible idea and it’s an absolute blessing that they have gone out of style. Well, the one in the crappy motel that Neal and his irritating travel companion Del (John Candy) rent the first night looks janky AF, that’s for sure. These beds don’t look like they serve any type of massaging function, and indeed just make it impossible to safely enjoy any kind of beverage in bed — which, after a long day of travel, seems like a desirable thing to do. 4. 1980s/1990s movies were all about guilting you into feeling bad about being mean to gross, inconsiderate, yet somehow still well-meaning people, which really only seem to exist in said movies. The universe of moral obligation in most movies of this era seems to tell you that if someone is too talkative, physically gross, ridiculously rude, hella obnoxious, and has absolutely zero situational awareness, you should still be nice to them. I’m not saying this is necessarily untrue, especially if the person seems like an easy target (something Del actually calls himself), but if someone I was sharing a hotel room with after hours of travel left the bathroom the way Del did, I would have a really hard time not saying something. Dude left him a single tiny washcloth to dry off with, his nasty socks soaking in the sink, and a horrific mess all over the vanity, then spilled beer in the bed and smoked in the room, and then gaslit Neal into feeling bad for getting mad about it — or rather, the film’s writer/director John Hughes did. I get that we shouldn’t personally attack people who seem blissfully unaware of how rude they are, but when you’re that rude, you deserve some type of comeuppance. Sure, the thought does count. But then your actions do, too. 5. Sometimes, you just have to laugh at your situation, because there is nothing else you can do. When you have somehow managed to stumble into as much misfortune as these two, perpetuated by a mix of bad choices (e.g. throwing a still-lit cigarette carelessly into a car seat) and bad luck (weather, broken-down or missing vehicles, etc.) sometimes, you just have to stare at the wreckage, burning ragefully in front of you, and laugh maniacally. #ItsAVibe. 6. People in movies only carry framed pictures of people who are dead, so if you didn’t guess that Marie was dead by the first time Del pulled her framed picture out of his luggage, then…well, now you know. If you were genuinely taken aback by this “surprise plot twist” despite all the hints that were dropped throughout the movie, I’m sorry to break it to you but you are naive. This wasn’t some M. Night Shymalan super sneaky-ish, where your jaw is on the floor during the finale and you literally have to watch the entire movie again and see every interaction or line of every scene in a new light. In “Planes, Trains and Automobiles,” dude was speaking lovingly to a framed picture of a woman that appeared to be from the mid 1960s. He also “spoke to her” while sitting, freezing, in a car he was responsible for burning down to the frame. (I’m glad Neal felt bad for him in that moment because he may have not survived through the night and would have actually joined Marie on the other side.) I do find that Neal’s realization at the end of the movie and his subsequent taking in Del to his home was beautiful and heartwarming, and the only way the movie really could have, and should have, ended. I just don’t get why this obvious fact is only revealed to him, and moviegoers, while he’s on the final train out of the Loop. Okay…I guess because movies. 7. In 1987, the Brown (?) Line waited for you while you had three-minute long goodbyes with people on the platform. Such pure times, lost to us now. 8. Being a kind, compassionate, open-hearted, forgiving, and optimistic person may not excuse you from all of life’s hardships, but it certainly makes it easier on you… and everyone else. Plenty of movies, and just stories in general, are parables on how simply possessing these qualities can help you overcome difficult circumstances. In this one, two polar-opposite characters end up facing very similar conditions, but their attitudes are what drive the plot. Quixotically, despite all the chaos that one character causes with his poor judgment, ultimately his presence still makes his counterpart’s life easier. When Neal says, “I think we’ll get where we’re going a lot faster if, uh… we were alone,” we already know that Neal will not fare nearly as well as he did with Del at his side. And, it’s no accident that Del somehow ends up with all the luck. It’s not luck, after all, but rather he’s got good karma stashed up, from genuinely making others happy in life. Granted, he’s also a swindler who marketed shower curtain rings as earrings to unsuspecting young women, but he’s got connections everywhere for a reason. He simply knows how to relate to people, fully and wholeheartedly, in a way that few people know how to anymore. That’s right, even though Del literally lit a car on fire while driving on the wrong side of the highway at night, we all have something to learn from him.